News | THE SURROGATES is a NYT Bestseller 3 weeks running! Nate Powell wins Ignatz! THE SURROGATES is a NYT Bestseller 3 weeks running! Nate Powell wins Ignatz! Funny what a big-budget film adaptation starring Bruce Willis will do for your book... now more than ever, people are diving into the world of The Surrogates! Top Shelf is delighted to announce that Robert Venditti and Brett Weldele's graphic novel has now held on to the New York Times Best Seller list for three consecutive weeks! See for yourself at the Times' Arts Beat blog, and join us in congratulating the two creators. If you still haven't experienced The Surrogates, you can read a short preview here or download the first chapter for free for your iPhone. And how about that Nate Powell?! On top of the 2008 Ignatz Award for Outstanding Debut, the LA Times Book Prize nomination, and the Eisner Award for Best New Graphic Novel, Nate recently continued his streak of honors by winning the 2009 Ignatz Award for Outstanding Artist! 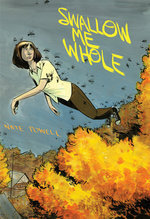 Nate's Swallow Me Whole is an incredible book that speaks to the confused teenager in all of us, and we're grateful that it's been so warmly received.